Rock art carved on limestone boulders in Winnemucca Lake, a dried lake bed in northwest Nevada, is at least 10,500 years old and may be as much as 14,800 years old, a new analysis confirms. Even at the lower age range that makes these petroglyphs the oldest known in North America, and at the higher range it makes them contemporary with some of the first people to migrate to the continent from Asia. Winnemucca Lake had some water in it as recently as the 1930s before construction projects drained the shallows for good, but at various times in the past it was so filled with water that the boulders on the western end of the lake were completely submerged for thousands of years. The carvings could only have been done when the rocks were above the water line. 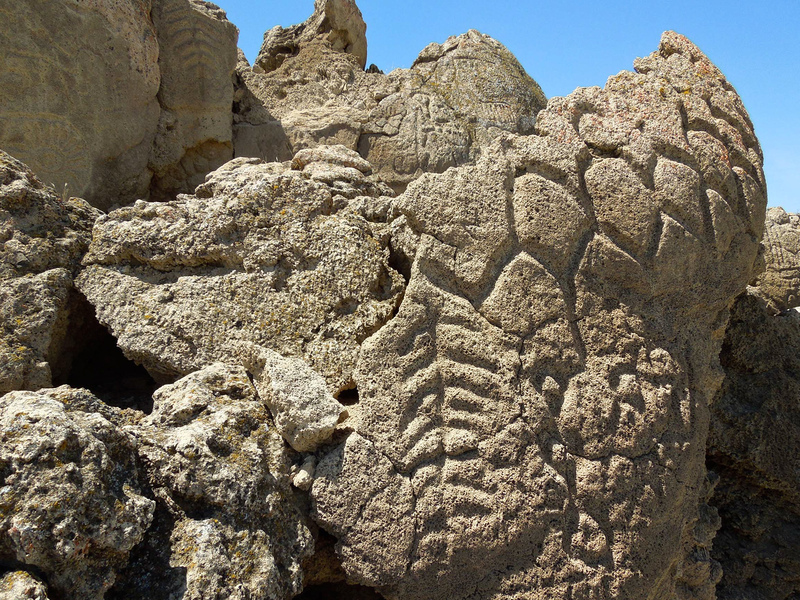 In order to determine when the petroglyphs were made, therefore, University of Colorado Boulder geochemist Larry Benson radiocarbon dated crusts of carbonate left on the boulders when they were under water. He found that a carbonate film underneath the rock art is around 14,800 years old while the carbonate crust on top of the art is around 11,000 years old. Additional information from rock and sediment core samples from adjacent Pyramid Lake narrowed down the range further, suggesting the boulders were above water in two phases: once between about 14,800 and 13,200 years ago, the second time between about 11,300 and 10,500 years ago. Before this study, experts thought some of the petroglyphs at Long Lake, Oregon, were the oldest in North America. The most ancient Long Lake rock art (there are pieces carved as recently as 500 years ago) is dated by the ash which covered it after the eruption of Mount Mazama around 7,300 years ago. That means the art is at least that old and may be older. 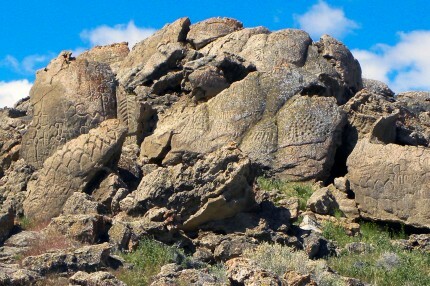 There are some stylistic similarities between the Oregon petroglyphs and the Nevada works. They both have abstract designs of lines straight and curved, alone and in parallels, rings, swirls that appear to be part of a larger composition. The Winnemucca Lake rock art also features pieces that may be abstract renderings of nature — interlinked diamond shapes, trees, flowers, chevrons bisected by a central vertical line that suggest the veins of leaves. Individual carvings in the soft Nevada limestone are as small as eight inches wide to as large as three feet wide. The petroglyphs are carved deep by what means we do not know. Larry Benson speculates that the artists used hard volcanic rock to carve into the soft limestone. As long as the carving tools are harder than the medium, it wouldn’t have taken too much time to get the job done. It still could have taken centuries for all the works we see today to have been carved, of course, or they may have all been done in one fell swoop. 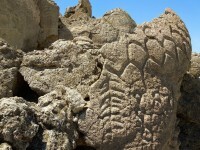 Additional details about the dating might be determined by taking samples of carbonate from inside the carvings, but the petroglyphs lie within the borders of the Pyramid Lake Indian Reservation and the Pyramid Lake Paiute Tribe agreed to let Benson research the art only if he didn’t remove anything, not even a carbonate scraping, from the carvings themselves. (Some Native American tribes believe the spirits of the artists reside in their work and thus taking any part of it would be tampering with their ancestors’ souls.) He took his samples from the sides of the glyphs instead.